Let’s get serious and take a long look at a question we get asked a lot how to take the next step in becoming a better guitarist. It doesn’t matter if you are a beginner or an intermediate or even an experienced player, we all want to improve on the skills that we have. And as I’ve said before, sometimes the quickest way to improve is to simply be aware of what you already know. Here at Guitar Noise we’re always up for an ambitious undertaking. 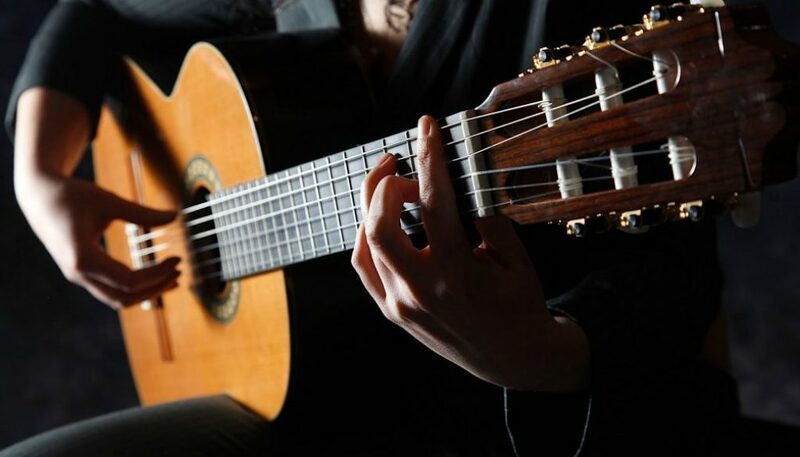 Over the next number of columns we’ll be examining the basic chord and fretboard theory that we already know and then use it to take that next step in playing. You’ll find how easy the concept of “moveable chords” can be and also learn your basic lead scales. We’ll then examine how these two techniques are used to come up with simple “tricks” to create fills, riffs and leads. We will not only analyze other guitarists’ leads, we’ll also come up with some of our own. To make matters even more interesting, these columns will crossover with the upcoming lessons on both the beginners’ and intermediates’ pages. And that’s not to mention a few surprise columns (and co-authored pieces) that some of you have been clamoring for. An intermediate guitarist is one that has started to think for his or herself. He or she makes observations and then experiments in coming up with new things. It doesn’t matter if it’s as easy as a change in a strumming pattern, playing a Dsus4 instead of a D or playing a riff learned from one song during a different song because it has the same chord progression as the first. Whether this guitarist realizes it or not, she/he has taken the first steps toward developing a personal style. Think about this: what makes a guitarist “good” or even just “interesting?” Often it is the little touches being thrown in here and there. A good guitarist makes the simple things interesting. He or she comes up with ways to make you want to listen to things. It may be nothing more than playing one chord in a different place on the fretboard, which is what today’s lesson is all about. I want you to forget about everything but the first three strings of your guitar. What we want to do is to look at the six basic chord shapes that occur on these strings. Okay, we know that the two most basic kinds of chords are the major chord and the minor chord. We also know that they both are constructed by using the root, third and fifth of their respective scales or by starting with the root and stacking the correct thirds onto each other. Are you with me on this? Remember that even though we have three (as yet unknown) shapes, we will have two forms of each shape – one for the major chord and one for the minor. But because you already know the diffence between a major an a minor chord is in the third (the root and fifth are still the same), you’ll see that there’s not all that much difference between the two forms of each shape. The really cool thing is that you already know these shapes! You just may not realize that this knowledge is already in your mind and in your fingers! What do you, personally, know about your guitar? Do you just make the chords according to the TAB or charts and think, “I know how to make a D chord!” or do you also take the time to know what notes make up that chord? A lot of people think that music theory is hard, but most of it, the stuff that can make you a better guitarist, has always been right at your fingertips. Those of you familiar with barre chords will recognize them as the top half of E major and E minor styled barre chords (and if you want to see a chart of those, you can find one in the column But Then Again…). Even though this fill is played only on the E and G strings, the E Shape chords of D, C, Bm and Am are what makes it work. When playing a run like this, I find it easiest to anchor your middle finger on the G string. This way I can use my index finger for the E string on the major chords (D and C here) and my ring finger for the minor chords (Bm and Am). By minimizing my hand movement I get both smoothness and speed. Again, it’s really important to remember that all these shapes have both a major and a minor form. That’s why there’s a total of six of them. In this short lead line, we use the minor shape to get the two notes in the Bm and Am chords and then revert back to the major shape for the G. Here, since we are only using two strings, I find it easier to use the same fingers for each shape – the middle finger on the B string and the index finger for the E.
Notice how in the last phrase, we use chords in both the D shape (G, A and the final D) and the E shape (the first D and the Em) to climb up the scale. If your guitar doesn’t have a cutaway and that last D shape is hard to reach, do what I do and use the E shape D instead. It still sounds fine, especially on a twelve string. Also, on this particular example you can use your open D and A strings to serve as a drone. The D shape lends itself nicely to this, particularly if you’re playing in the key of D or D minor. This starts out with typical first position chords but then the final four chords of the progression are played up the neck. The G is a D shape and the D and C are done with the A shape. And if you want to see a other good examples of the use of these chord shapes, check out the next Easy Songs For Beginners lesson, Love The One You’re With. And the upcoming song on the Intermediate’s Page, Supertramp’s Give A Little Bit, explores this technique with even more depth. I hope that you will check out these lessons and see exactly where and how you can use these moveable chord shapes to improving your own playing. Whether you are looking for a way to come up with the same chord voicings you hear on a recording or looking to make an arrangement of a song, whether you are trying to come up with a little riff or fill or even just use an old chord in a new way, these three shapes will give a place to start learning more about how to improve your playing. Now it’s good to point out that when you use just parts of these shapes, you can blur the distinction between them. For instance, in the earlier example Wild Night, I could say that the chord progression D, C, Bm, Am (all in E shape) might just as easily be D (E shape), C (E shape), G (D shape), F (D shape). If you noticed this then pat yourself on the back – you’re starting to think. The fun of theory is seeing how different chords relate to each other. After all, changing one of the three note of one chord gives you a different chord. This is one of the many things that we will be looking at as we expand upon this topic, but for now, I think we’ll stop here to take in all that we’ve learned. Learn one a week if that’s the easiest way for you. Write out the ones you use a lot – it’ll help them stick in your mind if you figure them out yourself. And, believe me, you’ll learn it a lot quicker if you use it in a song that you play a lot. Take Margaritaville or one of the other lessons on the Easy Songs For Beginners page. You’ll be surprised how quickly it comes to you when you use it for real instead of just thinking about it. As always, please feel free to write in with any questions, comments, concerns or topics you’d like to see discussed in future columns. You can either drop off a note at the Guitar Forums or email me directly at dhodgeguitar@aol.com.